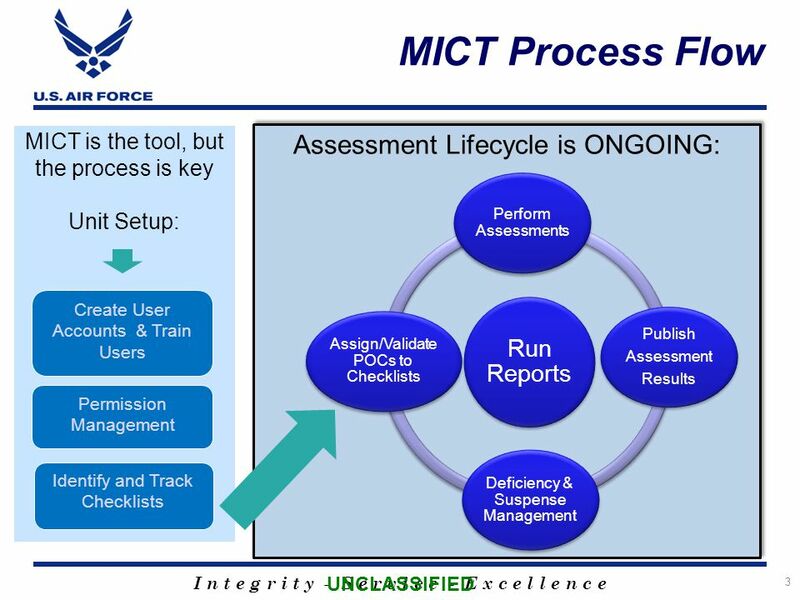 I n t e g r i t y - S e r v i c e - E x c e l l e n c e 1 Press Kit IV: Management Inspection Control Toolset (MICT) SAF/IGI Office of The Inspector General. 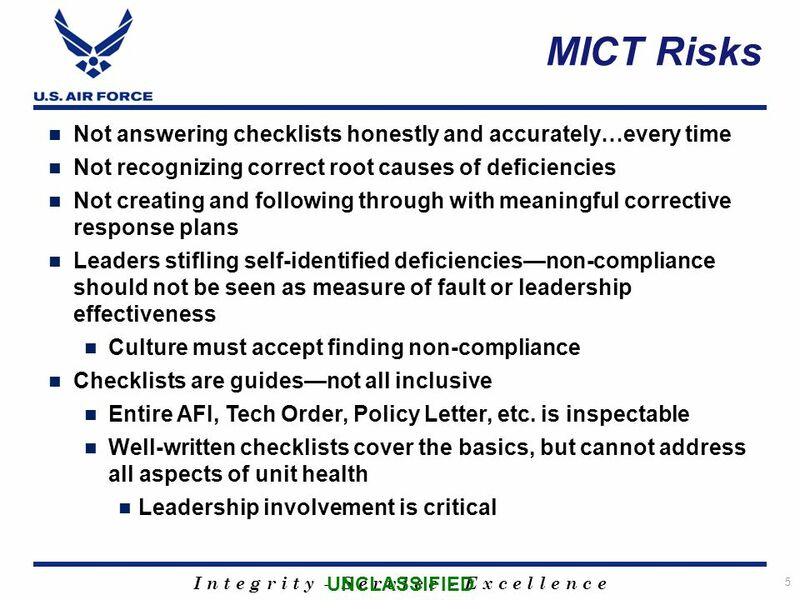 Download ppt "I n t e g r i t y - S e r v i c e - E x c e l l e n c e 1 Press Kit IV: Management Inspection Control Toolset (MICT) SAF/IGI Office of The Inspector General." 5 th June 2008 Peer review and development Penny Silvester Divisional Manager Learning and skills. Oversight and Accountability: Working together to improve care in police custody Sarah Green IPCC Commissioner. Organizational Learning for System Improvement. The Philadelphia Department of Human Services mission is to provide and promote safety, permanency, and. LYDIA HARKEY EIR ACCESSIBILITY OFFICER TEXAS A&M UNIVERSITY COMMERCE FALL Implementing Accessibility Strategically at Your Organization. 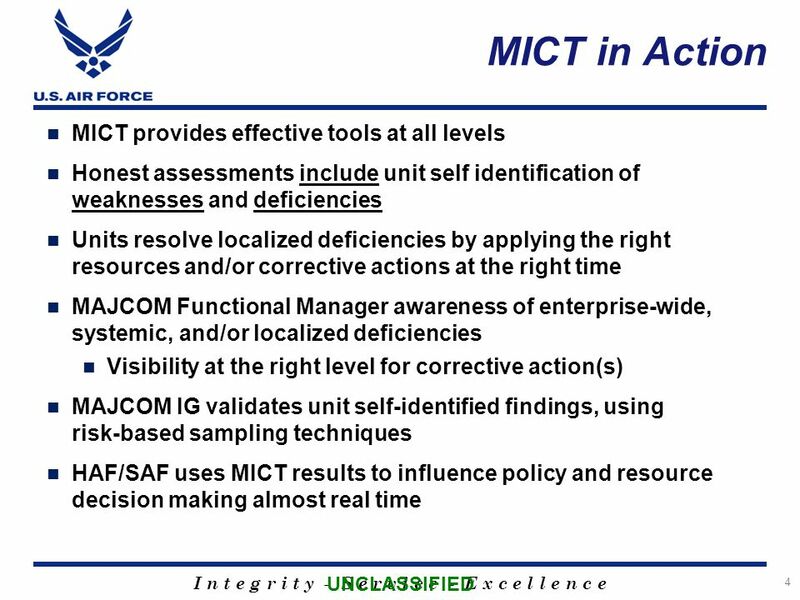 I n t e g r i t y - S e r v i c e - E x c e l l e n c e 1 Press Kit II: Unit Effectiveness Inspection (UEI) SAF/IGI Office of The Inspector General 24. The Marzano School Leadership Evaluation Model Webinar for Washington State Teacher/Principal Evaluation Project. 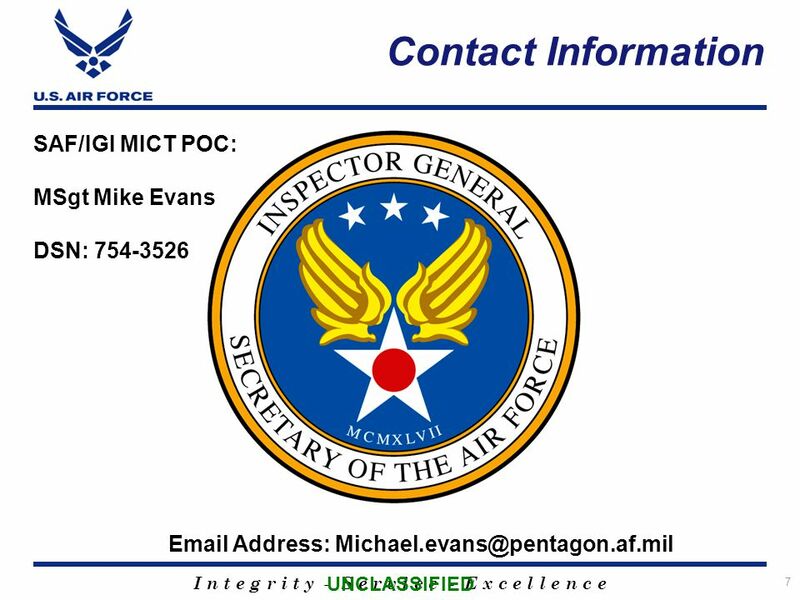 I n t e g r i t y - S e r v i c e - E x c e l l e n c e 1 Press Kit IX: Commander’s Inspection Report (CCIR) SAF/IGI Office of The Inspector General 24. 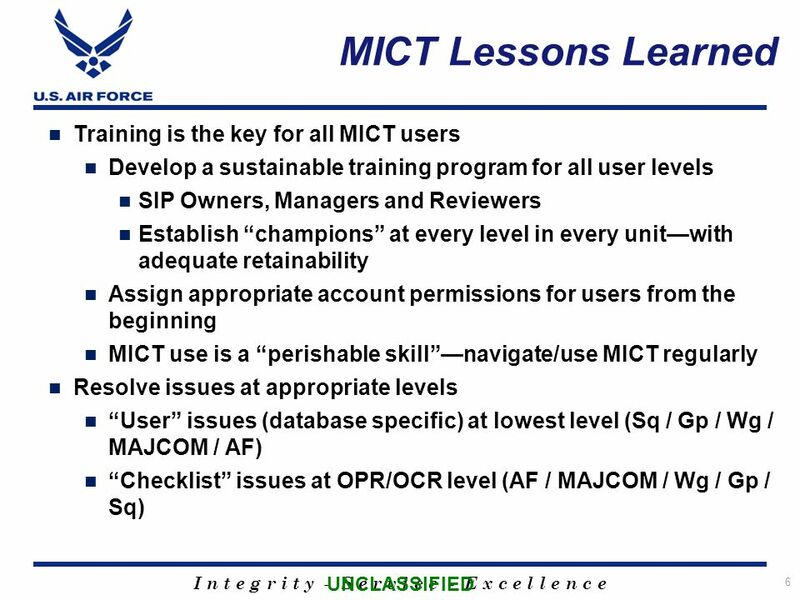 Back to Basics David L. Presuhn Manager Configuration Management and Product Definition Integration Boeing Commercial Airplanes. Managing Risk: Turning the Titanic Into the Love Boat Kevin Lyday, CISSP, PMP, CIPP/G, CEA, etc. Associate Director, Information Resources, Office of Public. Sustainable Development in Inspection Bryan Davies HMI. 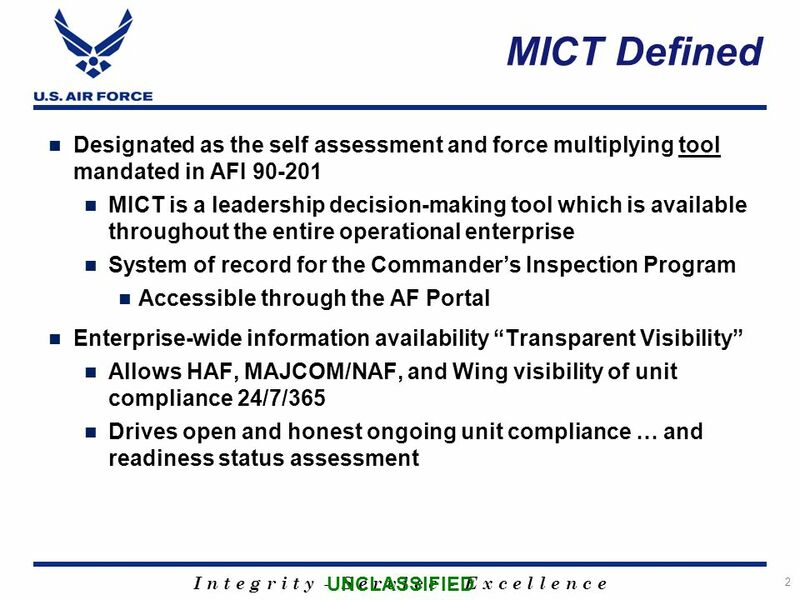 I n t e g r i t y - S e r v i c e - E x c e l l e n c e 1 Press Kit V: FAM Role in new AF Inspection System (AFIS) SAF/IGI Office of The Inspector General. Good Practice Guidance for Transport Assessments in London Keith Sowerby & Hannah Shrimpton TRAVL Conference 14 th March 2006. Lecture 2b: Software Project Management CSCI102 - Introduction to Information Technology B ITCS905 - Fundamentals of Information Technology. 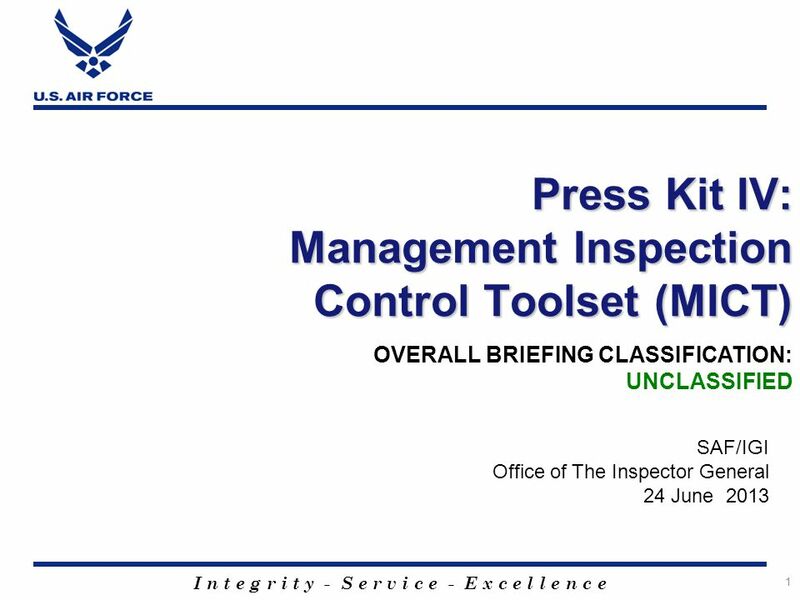 I n t e g r i t y - S e r v i c e - E x c e l l e n c e 1 Press Kit VI: UEI Continual Evaluation SAF/IGI Office of The Inspector General 24 June 2013 OVERALL.